Located in the center of River Run Village, 8295 Silver Mill is the perfect choice for convenience. You'll park in the underground and heated garage with elevator service directly to your condominium. Silver Mill's lobby is equipped with a pool table, entertainment sitting area, and fireplace. Located just outside the main lobby door are 3 hot tubs with access to the Dakota Lodge swimming pool across the courtyard. Staying at Silver Mill is smart vacationing! This cozy and comfortable one bedroom one bathroom unit is 600 square feet and sleeps up to four people. With this Gondola Resorts unit you will enjoy being in the middle of the action and only a short walk to the gondola! 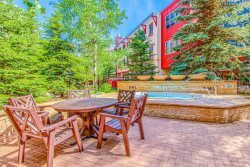 The unit offers a fully-equipped kitchen and gas fireplace with views of the River Run Village courtyard. Bedding includes a queen in the master and a queen sofa sleeper in the living area.